While touring the Countries in Epcot, many visitors enjoy tasting foods from around the world. Whether it be pastries in Norway or caramel in Germany, many visitors flock to Epcot to try it all. On our last trip to Epcot, we decided to do something totally different. We decided to eat in America. Forget those tacos from Mexico…that pretzel in Germany…we want pure Americana. Now, I do not mean this is any bad way whatsoever. We had been in the park all day (minus a mecca to Jose) and it was getting late. Everyone was hungry and the one thing everyone liked was pure American Fare. We headed over to Liberty Inn and got in line to chow down. The menu from Liberty Inn offers the best of Americana…burgers, dogs, fries. I opted for the Southwest Black Bean Burger and Fries Combo with a Diet Coke and a lovely Mickey Shaped Rice Krispie Treat. 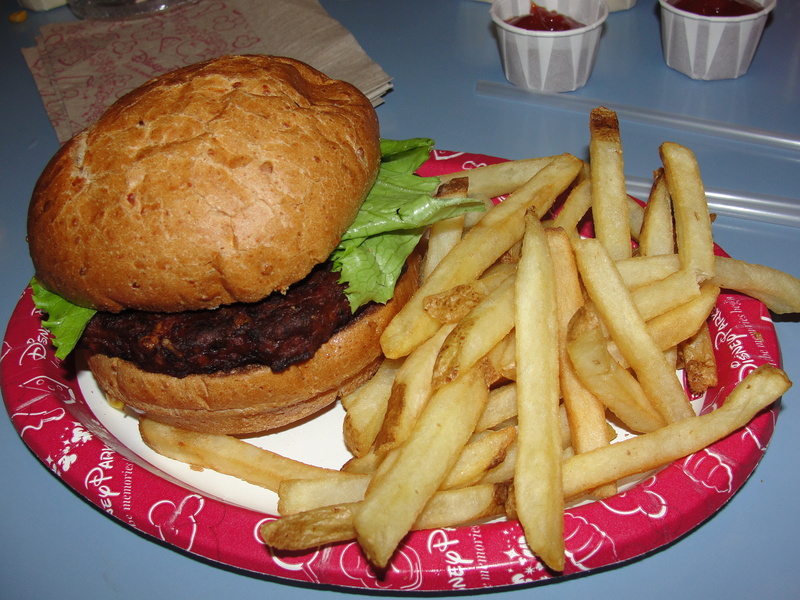 Disney offers some really great veggie burgers and I am always down for one. The food arrived rather quickly (it was 8:00ish, Saturday night, not many people in restaurant) and we went to eat. I dug into my Southwest Black Bean Burger described as, ‘Monterey Jack, corn salsa, chipotle mayonnaise, lettuce & tomato.’ The burger itself has a great southwestern, black bean taste. The flavor was not overpowered with cumin, which is normally what happens with black bean burgers. The bun was soft and had a decent flavor. My only beef with the bun is that it was a bit too thick for my liking. The toppings were good and there were just enough of them. Many times you find the toppings are more than the burger but, in this case, the ratio was great. There was a little bit of a spicy flavor but nothing to the fact of being too much. Overall rating: 7/10. I am a huge fan of Rice Krispie treats and always get some while at Disney. The treat I got at Liberty Inn was in the shape of Mickey Head and the ears were dipped in chocolate. I saved this until we got back to the hotel and enjoyed every bite of it. The treat was so soft and fresh tasting and the chocolate dipping, was just enough. Excellent treat with extreme freshness. Overall rating: 9/10 (because I wish I had more…right now…all the time). The rest of the family ordered a few other options from the menu including a chili cheese dog and pulled pork sandwich – everyone enjoyed their meals. Americana in Epcot is not a bad thing. Everyone left full, content and happy. Yes, it may not be as exciting as the croissants in France or the sushi in Japan but, it is good ol’ Americana burgers and fries. And, at the end of the day, you can’t go wrong with that.